Well, today I thought I’d briefly talk about the origins of this particular comic. 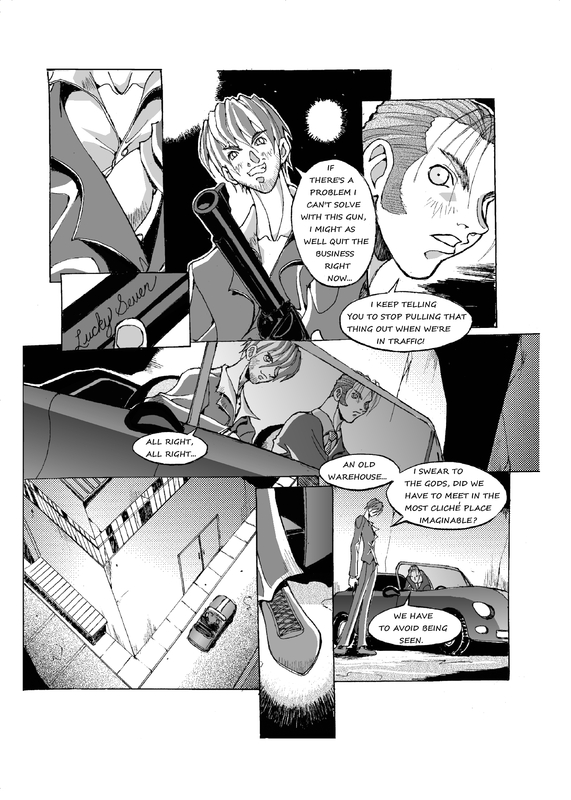 You see, when I first started working with Brandon Franklin (the artist behind this comic), we wanted to collaborate on something that we could submit to Tokyopop’s Rising Stars of Manga contest. I had already written several Zokusho stories at that time, but none of them really fit into the twenty page self-contained story requirement that was put down by the contest rules. So, we wound up with this little piece of Serge and Max’s past. Hopefully you guys like it better than Tokyopop did. I remember this story. I read it as part of the Reviewing Workshop! But that was never finished and I was kind of disappointed. I am happy to be reading it again with the visual concept. Though my imagination had the two men looking completely different. And have I told you lately that I so hate you for getting me hooked on yet another web comic. well edgar will appear a little bit in the short story after this, and there is always the so far unfinished zokusho fight that i might try and finish at some point.